Lacrosse is the fastest growing sport in the country. According to an NCAA report, growth in lacrosse outpaces any other sport from 2000 to 2014, with participation in women’s lacrosse increasing 109 percent and men’s increasing 95 percent. Participation in high school lacrosse is also increasing. According to the National Federation of State High School Associations, boys’ lacrosse saw a 27.8 percent increase from 2009 to 2014, while girls’ lacrosse saw an increase of 31.2 percent. No other sport had a growth rate more than 10 percent in that time. If you’re interested in signing your child up to play this increasingly popular sport, you’ll want to familiarize yourself with all the equipment that’s involved. This guide is a good place to start before you head out to the sporting goods store. 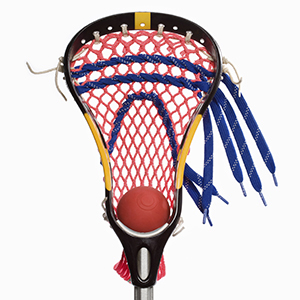 Lacrosse sticks consist of two main parts, the shaft and the head. Each of these items is typically sold separately, and different positions require their own equipment. A player’s position on the field will determine what shaft length they need. Attackers and midfielders usually use sticks that measure 30 inches long and are lighter for quicker movement on the field. Defensive players will use a longer shaft at 60 inches, and goalies will use a stick that is around 40 inches long. Shafts are typically made from one of four materials. Aluminum alloy shafts are strong and more affordable. However, they have no natural grip and are not as strong as more advanced models. Aluminum alloy shafts are best for young, developing players. Composite shafts are made from high-grade carbon fiber and are strong and lightweight. They are perfect for intermediate to advanced attackers. Titanium shafts can take hard hits. They are stronger and lighter than aluminum models and best suited for advanced defensive players. Elite and pro athletes opt for scandium alloy shafts. This shaft material is extremely lightweight, but still stronger than aluminum. It’s incredibly durable and is the preferred choice for elite level players. Lacrosse heads come in many shapes and sizes. You can find up to 30 different styles in just one store. 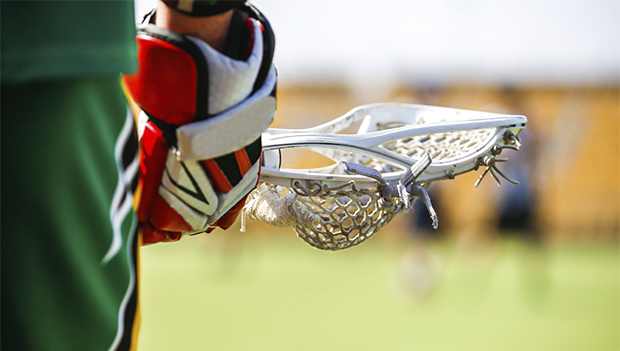 Every lacrosse head consists of six main parts: the scoop, shooting string, ball stop, throat, pocket and sidewall. In general, the scoop and throat are the two main areas that vary among lacrosse sticks. The scoop is located at the top of the head and is used for scooping balls, while the throat is the part of the stick head that meets the shaft. When looking at a head, the stiffness, weight and durability are important factors. As with lacrosse sticks, different positions require customized equipment. A defender will likely want a flatter scoop and stiffer head because it is better for checking, while attackers and midfielders will want a more rounded scoop and a flexible head that gives them more control for catching and passing. Goalies will have sticks with pockets that are much deeper than the other players on the field. The NCAA has guidelines for lacrosse head dimensions. It outlines four specific places on the head that must meet measurement requirements. Lacrosse heads will be labeled according to their level of play. Universal heads can be used to play at any level and are usually designated with a “U” or “X” on them. NCAA legal heads can be used at the college level, but not at the high school and youth level. NFHS heads are legal at the high school and youth level, but not at the college level.